Should You Vacuum the Aquarium Gravel? Should you vacuum the aquarium gravel weekly, occasionally, or not at all? It's a hotly debated topic. Here are responses from aquarium owners as Thelma asked their opinions. Thelma: I'm new to this art of keeping fish but I have done my homework on getting to understand the nitrogen cycle. But I keep getting mixed feedback as to how to properly do so. Some hobbyists say to do the water changes, vacuum the gravel, and change the filter cartridge while others just say to do only the water changes and let the junk accumulate so as to help the growth of the 'good' bacteria. I siphon the gravel to clear away uneaten food. I know the vacuuming is causing my tank to cycle slower because it has been four months and it's not there yet but I worry about ammonia build up if I leave the filter cartridge dirty and do not vacuum. I would like to know other readers' experiences and thoughts on this matter. Carl responds: I have a planted tank. I never, ever vacuum my tank. As for filter changes, I use a pair of canisters. I change the fine filter floss when it starts slowing the water flow, and I will throw the sponges into my washing machine with only hot water. I have ceramic media that I count on to maintain a good colony of bacteria when I perform this type of maintenance. The caveat to this is that I don't recommend this for anybody who doesn't know exactly the effect this will have on their tank. Kejuke responds: I do a very light vacuuming about once a month, or if I happen to notice any visible debris. As far as changing filter media; I usually just rinse it in the water taken out of my tank. I've used some filter pads for over a year, and filter bags that hold media about the same. 1077 Responds: I never change filters unless they begin to fall apart. I simply rinse them in aquarium water during water changes.I keep rams, keyhole cichlids, discus, and tetras. They are demanding when it comes to water quality so I vacuum the substrate at each water change, a small section each time, a different area each time. I vacuum lightly so as not to disturb bio- bed too much. Water changes of 20 to 30 percent are performed weekly. I would not vacuum a new tank until beneficial bacteria was well established. Better to feed less so as not to overwhelm the bacteria .I would also add fish very slowly for same reason. Bill: There is no reason to vacuum a properly maintained new tank. It may be necessary to spot vacuum. 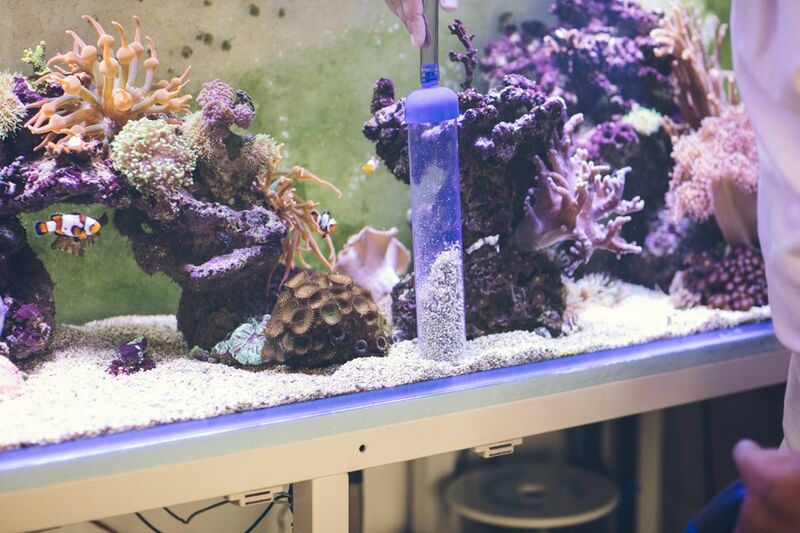 In any type of stocked aquarium, there should not be junk accumulating on the bottom if feedings are done properly. In new aquariums especially, and in well-established aquariums, filter cartridges should not be changed as often as the packaging suggests. If there is a really good colony of bacteria doing its job then why destroy it? Once you remove the cartridge in a well-populated tank you will have a spike in ammonia. The little bit of cheap-grade carbon found in new filter cartridges will not have an appreciable effect on the spike. I have always recommended to my customers to leave the cartridges alone unless it is clogged and the water is backing up through the filter, or the filter is falling apart. The newer cartridges are being produced in flimsier form because the manufacturers are realizing that aquarists are becoming more educated and are not replacing them. I tell people that if the filter is getting clogged then during a water change remove the cartridge and shake it out real well in the bucket that the siphoned water is in, then put it back, it will still have a healthy population of bacteria on it. If the filter is falling apart then buy a new one and place it in the back of the tank in a corner for a week, then switch them and then be prepared to do the standard water change twice a week for a few weeks rather than once a week. My customers rarely face any of these problems because they are taught to feed properly and avoid an abundance of particulate matter that clogs filters and covers the bottom of the tank. I acknowledge certain circumstance where you may have higher than normal debris levels. Learn to feed properly, do not over clean a tank, and vacuuming becomes unnecessary, for the most part. Craig responds: f you are going to upgrade an old filter, it is advisable, if possible to add the new one and leave them both running on your tank for about a month so the new one has a chance to be colonized by beneficial bacteria before you remove the old one. When carrying out ammonia tests you should always carry out pH tests as well, because the toxicity of ammonia will change depending on the pH level. For example a level of NH4 = 2 mg/l at pH 7 is harmless but the same NH4 = 2 mg/l at pH 9 is acutely toxic. So you may find that you are worrying without cause. I have never used the test strips so am unsure of their accuracy, of their scale or if they are measuring NH4 or NH3. I use and recommend the brand SERA which tests for ammonium (NH4) and provides a conversion chart to ammonia (NH3) @ pH. What uneaten food and fish poop that isn’t removed by your filter settles into the gravel and is then set upon by the nitrifying bacteria thereby converting it into nitrite. By disturbing the gravel you probably found your water became rather dirty to look at. Left alone it would have cleared in an hour or so, time dependent on the effectiveness of your mechanical filter. Remember also that the gravel forms part of your biological filter, so by disturbing it….well you can guess the outcome. I would not suggest nor recommend adding any type of ammonia remover because depending on how they are designed to work they all have the tendency to starve your biological filter, which could also be why your ammonia spiked. Therefore I would say bad and unnecessary. Making changes to a matured tank is not a big deal. Making changes to a semi-matured tank, I would wait until it matured. Test your water weekly. Don’t test too often, if your fish look unhappy then test, I would wait at least 24 hours before testing after making the changes you did and also I would see how those ammonia reducer rocks work in your toilet. My recommendation will always be to make changes in small increments, wait for it to settle then make more changes, then if something goes haywire it is easier to pinpoint what caused it and then to correct the problem. Carl: Water changes and tank maintenance are a regular chore and are not discontinued just because you don't have measurable ammonia. Typically you will want to change between 10% and 20% weekly. 1077: It is in my view better to change 20 to 25 percent of water each week replacing it with dechlorinated water of the same temp or close to it. Depending on the type of fish and poop they make and how much is being fed, You may get away with vacuuming twice a month but I recommend vacuuming a small area each week, a different area each time. Otherwise decaying food and waste can build up . Sometimes this stuff will collect under ,in, or on decorations and vacuuming is the best way to remove it. Craig: If you want your fish to be happy and your tank to continue to look good, it has to be a weekly occurrence, it will not end. I change 10 to 15 percent water every week, I vacuum a different portion of the gravel every second week, I do water tests every week which determines the amount of the water change. My fish are happy and my tank looks pristine. Bill: Changing water does not reduce the number of beneficial bacteria in a tank. Beneficial bacteria colonize surfaces where oxygenated water passes over them. They are not in the water column. I disagree with the recommendation to vacuum every other week. Vacuuming is a tremendous disturbance to a healthy tank. It may become necessary at times with certain fish species or certain specialized setups. But even under these circumstances, it should not be necessary on a weekly or bi-weekly schedule. I disagree with the recommendation to add "cycle" or any other brand of so-called bottled bacteria. A healthy established tank will do fine without it, and certain brands of bottled bacteria that have been stored improperly in warehouses or retail shops become bottles of decomposed material that cause high ammonia. Not to mention that certain brands cause skewed water tests. A healthy well-established tank needs very little aside from frequent small partial water changes. A 10-15 percent water change along with proper feedings and a proper stocking will result in few or no problems.